SINGAPORE, 2 August 2018 – Canon today announced the launched of three compact PIXMA printers primed to enhance home and home office productivity with a host of features such as flexible printing layouts, automatic two-sided printing for time savings and ability to print on special media for custom designed nail art. This Wi-Fi enabled device extends Canon’s A3 printer lineup with powerful creative functions such as built-in pattern designs that make it easy to produce beautiful gift-wrapping papers, and a new multipurpose tray that makes self-designed nail stickers possible together with the new Nail Sticker Creator mobile app. A large 4.3” touch-screen display stretches across the tilt-operation panel, and makes it easy to perform wireless setup and also access functions on the printer. Available in red, white and black, this advanced all-in-one printer adds a touch of class with its sleek design to any modern home or office interior. Combining wireless connectivity and an arsenal of smartphone apps enables users to flex and express their creativity through a variety of printing functions from the printer. A 4.3” touch-screen LCD and an output tray that extends automatically for printing enhances convenience for users, making the PIXMA TS8270 perfect for consumers who value a top-of-line multifunction printer that combines stylish design with incredible print speed and productivity. 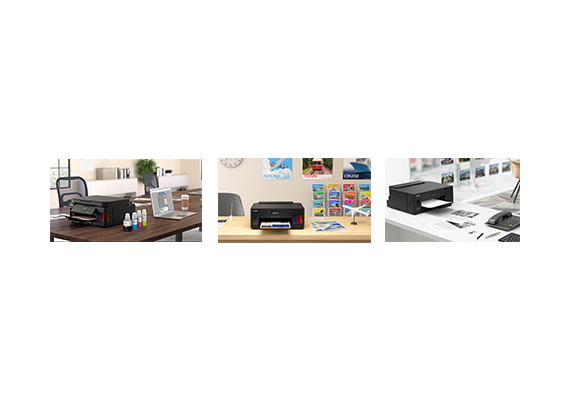 Deliver space-starved workstations from the pain of clutter with an ultra-compact office printer that performs print, scan, copy and fax. The PIXMA TR4570S features automatic two-sided printing, with other innovative features such as the ability to copy both sides of an ID card on a single sheet of paper, as well as in-device alerts when a user has accidentally left a document original on the scanner glass after scanning. The new printers support the new Easy-PhotoPrint Editor (EPP Editor) app for iOS, Android OS, Windows and Mac OS platforms. With this powerful app, you can now experience all printing possibilities with your printer. Print photos, design custom photo layouts, calendars, postcards and fridge magnets with the help of hundreds of stamps and frames. With a user interface (UI) design similar across multiple operating systems, users will find it just as easy to use the app on a mobile device as well as a notebook PC. All three PIXMA printers feature Canon’s innovative Hybrid Ink system that delivers the best attributes of pigment black and dye colour inks. For documents on plain paper, text characters render with impressive sharpness and contrast, while colour bars, charts, and photos stay vivid. The PIXMA TS9570 and TS8270 feature individual ink cartridges that contain single colours in every ink cartridge. 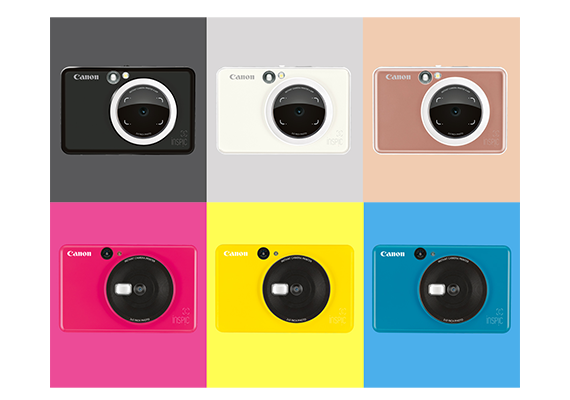 This 5-ink configuration on the TS9570 ensures that users replace only colours that have been depleted, allowing them to print in colour and manage ink consumable replacements effectively, The TS8270 also features an additional Photo Blue ink that enhances colour reproduction while minimising grain, making it an excellent companion for advanced photographers as well as home users. The PIXMA TR4570S operates with one black and one tri-colour ink cartridge, making it highly suitable for users with lower print volume demands. The printer is also compatible with higher-yield ink cartridge models to support growing business needs or simply projects that require higher print volumes. The PIXMA TS9570 completes a borderless 4R photo in approximately 21 seconds and a borderless A3 photo in a mere 85 seconds. The PIXMA TS8270 needs approximately 17 seconds for a 4R photo. Both printers support popular Instagram-style images with 5x5 and 3.5x3.5 inch photo paper formats, ensuring all photo details are reproduced edge-to-edge during printing. The PIXMA TS9570 and TR4270S feature an Automatic Document Feeder (ADF) design that can fit up to 20 A4 document originals for batch scanning, copying, and faxing³. On the TS9570, the ADF design combined with the ability to print in A3 sizes also opens the doors to more advanced copying functions. The TS9570 stands apart from other accomplishes complicated copy-and-layout tasks without involving a connected PC. Through the ADF, large, multiple-page document stacks can be compressed into A4 or A5 sized booklets with a new Booklet Layout Copy feature. A3 size originals can also be reproduced easily with an Oversized Copy feature that stitches opposing end-scans of an A3 original before a copy is made. Paper can be loaded in two directions (rear tray and cassette tray) and allows the switching between two different paper types easily, such as plain paper and glossy photo paper. The benefits of rear tray feeding also extend to the use of smaller format papers such as business cards, and thicker card stock paper because of the straighter paper path. For users with large paper jobs, both paper input orientations can be utilised for a combined A4 paper capacity of up to 200 sheets. The TS9570 and TS8270 will delight scrapbook hobbyists with up to 45 different types of built-in pattern designs that can be cut, cropped, and crafted into gift boxes, packaging, or book covers. When printed on A3 plain papers, they can even be used to gift wrap presents and giveaways. With the help of the new Nail Sticker Creator app⁵, users will also be able to create beautiful nail art with ease. Designs can be printed on Canon’s Nail Stickers (NL-101) before application to fingernails. A simple buff and topcoat application completes the process, saving time and also a trip to the nail salon. Nail sticker printing is available for the PIXMA TS9570 and PIXMA TS8270 printers. All three printers feature easy wireless setup and direct wireless connection to mobile devices. The inclusion of a new Wireless Connect button makes it easy to connect the printers to a secure home or office network, right out of the box. The PIXMA TS9570, TS8270 and TR4570S are available at all local authorized Canon distributors and dealers. 1Wireless printing requires a working network with wireless 802.11 b/g/n capability. Wireless performance may vary based on terrain and distance between the printer and wireless network clients. 2Duplex printing must be selected under printing preferences. Does not require manual reinsertion of pages to print on the second side. 4Applicable to PIXMA TS9570 and TS8270. PIXMA TS9570 supports only A3 size in the rear tray. 5Nail sticker app is free for download on the Apple App Store and Google Play Store and is compatible with Android 5.1 and later, iOS 10 and later. A3 Wireless Photo Printer with Large 4.3” Touch-Screen and Auto Document Feeder.